Papayas are very nutritious, tasty, a good source of folic acid & loaded with fiber. It is the best medicine to cure constipation in babies. Papayas can be introduced to babies between 7-8 months of age. I offered papaya to my baby at her 7th month once she is well tolerated with other foods like banana, apple & pears. Try to feed small amount when you start and later you can increase the quantity. 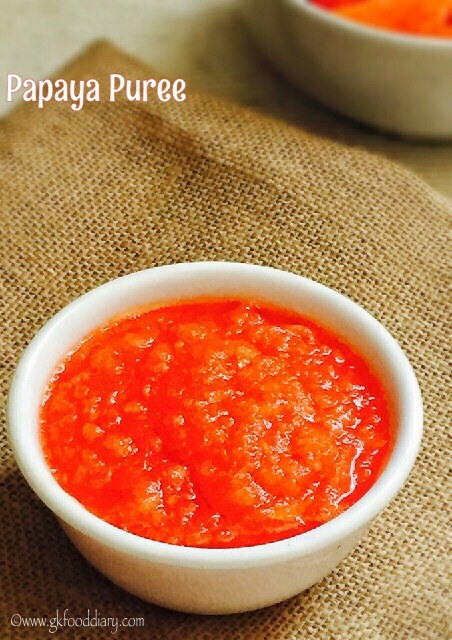 I used to steam the papaya for 5 minutes when I introduced papaya to my baby for easier digestion. If your baby has a sensitive stomach, steam the papayas and then Puree it. 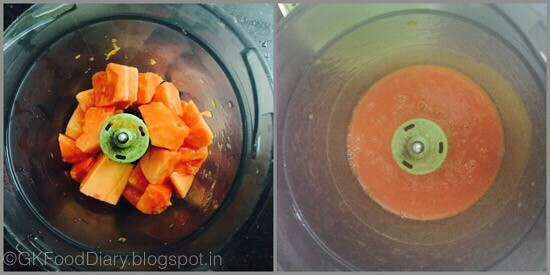 You could directly give ripe papaya without steaming too if your baby has good digestion. 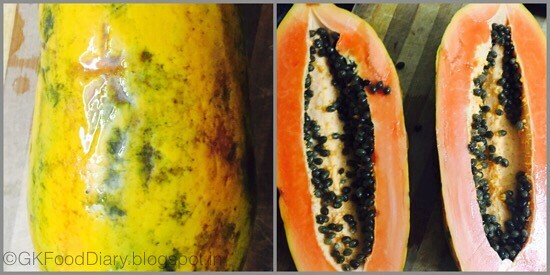 While selecting make sure ripe papayas with green and yellow color. Let’s check how to make papaya puree. 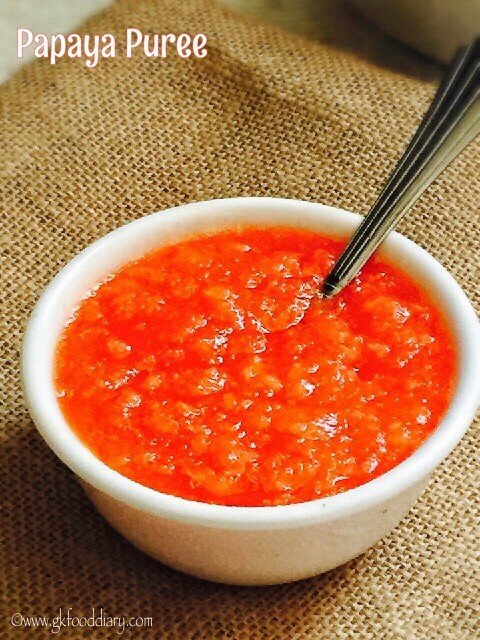 Easy and tasty puree for babies with papaya. Sterilize the bowls and spoons used for feeding your baby in a vessel with hot water for five minutes and keep it immersed in the same vessel until use. Wash papaya in running water well. Then peel the skin off from the papaya with a peeler and remove the seeds. Seeds are edible but babies can't digest it. So it's better to remove them. Then chop them into equal size small cubes. Steam the chopped papaya pieces in a steamer for 10 minutes if desired otherwise, you can skip it and directly blend it to make a puree. Once the papayas are steamed, it will be soft and transparent. Now blend it with little water to a smooth paste in a blender. You can steam it with Idli steamer plate by adding a cup of water or pressure cook it with a cup of water for 2 whistles. 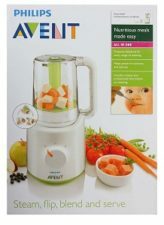 For both steaming and blending, I use Philips Avent Combined Steamer and Blender. 1. Sterilize the bowls and spoons used for feeding your baby in a vessel with hot water for five minutes and keep it immersed in the same vessel until use. 1. Wash papaya in running water well. Then peel the skin off from the papaya with a peeler and remove the seeds. Seeds are edible but babies can’t digest it. So it’s better to remove them. Then chop them into equal size small cubes. 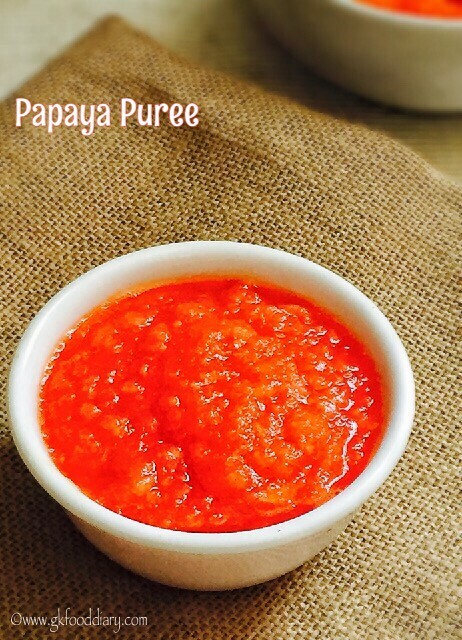 Healthy and tasty papaya puree are ready to feed your baby. Make sure the papayas are completely ripe before you make a Puree. You can mash it with the fork instead of blending the papayas. Generally, papaya doesn’t cause any allergies, but check for symptoms and stop feeding your baby if you find any. Steaming is a healthy option for baby food than pressure cooking or boiling. So I prefer steaming using an Idli pot or steamer. You can combine steamed Apple or mashed banana with papaya to make it wholesome.